Steinbach council is one vote away from ushering in its second pay increase in 18 months, but councillors took pains this week to note this one is prompted by factors outside of their control, and won’t cost taxpayers more. First and second reading of a new council compensation bylaw intended to preserve take-home pay by offsetting pending changes to the federal tax code received unanimous support at Tuesday’s meeting. The bylaw was crafted after the Government of Canada announced plans to remove a section of the Income Tax Act that exempted one-third of a councillor’s total compensation from income tax, beginning Jan. 1. 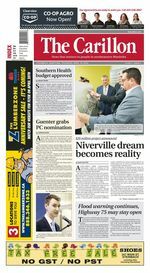 Councillor Jac Siemens estimated the federal government will collect an additional $30 million in revenue as a result of the change, while local councillors would take home hundreds of dollars less per month. If the city did nothing in response, Mayor Earl Funk said net pay would revert back to levels seen prior to July 2017, when a round of raises intended to remedy several years of stagnant salaries took effect. Funk later admitted he thought the awkward issue had been laid to rest before he learned of the tax code changes. "I thought we were done, that we were never going to have to look at our wage again." The new bylaw would see the mayor’s total compensation rise to $51,897 from $44,000, the deputy mayor’s to $24,220 from $20,535, and a councillor’s to $21,390 from $18,135. The maximum daily allowance for meal, travel, and living expenses would also increase to $224 from $180. "We spent a long time discussing this, and it was not an easy decision to make," Funk said. "This is a salary adjustment. This is not a wage increase," stressed Councillor Jake Hiebert. According to Councillor Jac Siemens, the city will "find the money within our current budget" rather than raise the mill rate. City manager Troy Warkentin confirmed the new compensation estimates are already reflected in the city’s proposed 2019 budget. Other municipalities across Manitoba have already hiked their pay to neutralize the taxation hit, said Councillor Michael Zwaagstra, who also serves as the city’s deputy mayor. "We’re not the only ones in this situation."